One of the special properties of the corner is that big eyes become smaller, meaning the extra liberties they normally have become void or reduced due to the eye being in the corner. 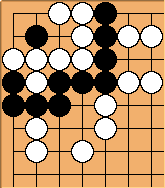 We have seen in big eye liberties that a squared four eye space creates five eye liberties. Let's see what happens in the corner. 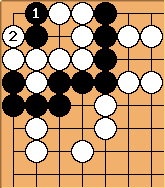 Even if White goes first, White falls two moves short: Black can make an eye inside White's big eyespace due to the special properties of the corner, giving atari. This way, instead of five liberties, White has only three. Preventing the eye with here makes matters even worse. 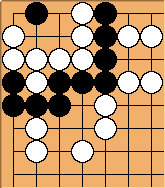 If we take the - exchange into account, White has two liberties. Black can exchange for , because otherwise Black would make an eye in the corner. 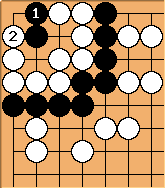 After the exchange, we see that White has three liberties (that is, 5 - 2) against Black's five. White is dead even if White has sente. Important to notice that the white eye still has its quality as a big eye if there are shared liberties. If the bulky five is positioned as in this diagram, it becomes a big eye again because now there is no way Black can make an eye in it. White wins this capturing race seven-to-five. Here too, we have to imagine the - exchange before counting liberties. 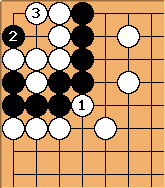 White: 8 - 2 = 6. 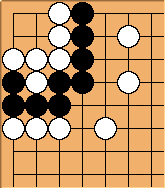 Black: 6. The player who begins, wins the fight. Again we must not mistakenly assume White has a six-point big eye with eleven liberties.